I first met Stefan Harg when I was an employee of T.W. Howarth (later to become Howarth of London). 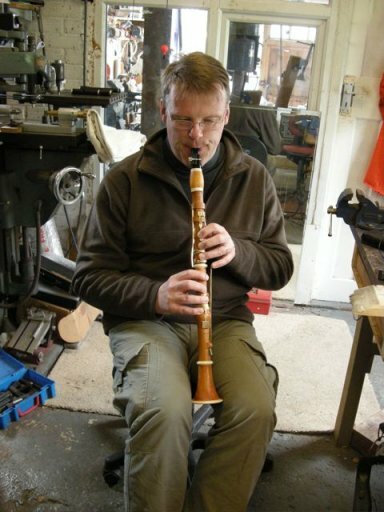 He commissioned the first basset lower joint for an A clarinet whilst he was playing Howarth S3 clarinets. We worked together regularly on tunings and the overall layout of the mechanism on the basset joint. I left Howarth in 2003 to start my own business and pursue projects that had been on hold due to my daytime work commitments. 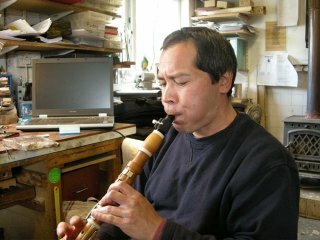 I continued to make clarinets for Howarth in my own workshop but did not lose contact with Stefan. It was in 2007 that Stefan contacted me with a proposition and possible commission to make a copy of the Bb clarinet held in the Stockholm Museum. This instrument was previously owned by Bernhard Crusell. This instrument, to the best of the museum's knowledge had not been the subject of a reproduction. Stefan had obtained permission for the clarinet to be examined and measured. I am indebted to Nicholas Eastop and Hans Erik for giving me the opportunity to not only view the clarinet, but to handle it and take accurate measurements. The instrument was in relatively good condition with nothing missing or damaged. However it was unplayable as the leather pads had deteriorated and would not seal. To have attempted to make it play after so many years without the neccessary renovations would have been detrimental to the wood. Without oiling the body of the instrument moisture and warmth could crack the instrument. It was quite obvious that the bore of the instrument had pulled in as it had dried over the years. This would have to be taken into account when making a reproduction instrument. The wood was boxwood (Buxus sempervirens). Judging by the colour of the timber it was likely that it was acid stained to give a beautiful golden hue, although it is possible that the instrument had been left in its natural state and taken on this colour through the passage of time. It is reasonably well documented that instrument makers of this period would use an acid stain to give a uniformity to the instrument to mask slight variations in the colour of the natural timber. Below, left: original instrument, right: Stefan Haag with the original instrument. Accurate measurements were taken for the keywork and body. Where the keys could easily be removed, tonehole measurements were taken. Unfortunately, some of the keys would not come off. I was able to gauge the size of the holes by sliding cigarette paper under the key, gently pressing to make a light impression and measuring the results. Returning to the UK, I set about making sense of the scribblings that seemed so clear when the instrument was in front of me! The first jobs were to make the reamer needed for the main bore, the flared reamer for the lower stock and the bell reamer. I make all specialised tools in house so this was not a problem. 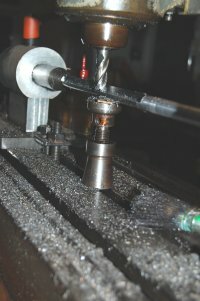 Above: Machining the quadrant from the main body reamer. The next job was to check the boxwood that I was seasoning for such an occasion. Fortunately it had reached the moisture content suitable for further turning work. Turning the boxwood was a relatively straightforward affair. As it can sometimes be a little unpredictable, I find it best to spread the turning procedure over a long period. This gives the wood time to recover and for any stresses to be relieved. This also gives the wood a chance to split, which I would rather it did earlier in the process of manufacture than later when many more hours have been invested in the instrument. My attention then turned to the manufacture of the keywork. 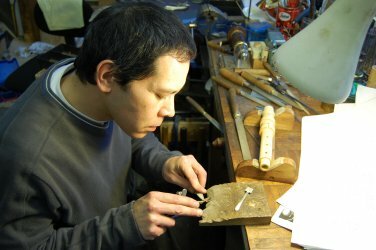 Brass is the traditional metal for key making for this period of instrument. Brass is an alloy of copper (Cu) and zinc (Zn), depending on the balance of each material alters the properties of workability and colour. The metals available from the suppliers did not have the characteristics I was looking for. Many of the standard alloys have metal additives to improve machining and resistance to tarnishing but they adversely affect the colour when dulled. My only solution was to have a brass alloyed to meet my criteria. Working closely with a casting company, after many attempts and much time (to allow the metal to tarnish naturally to its working colour) we arrived at a material that was suitable. Mounting the keywork on to the body seemed an straightforward challenge as I am used to making keywork for woodwind instruments. All this was to change when I started. The fitting between blocks required extreme patience to get the key to lie in the slot with no side play but just enough movement to allow the key to open and close smoothly. This was going to take a little longer than I anticipated. Although I have many machines at my disposal to assist me in the manufacture of instruments, I found this particular instrument demanded a degree of hand work that was quite extrordinary. It certainly gave me an insight into the manufacture of woodwind instruments during the period in which the original was made. 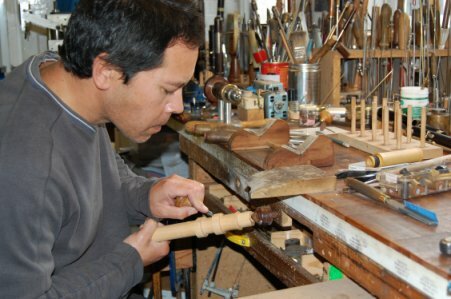 Meanwhile, Paul Charman was making a mouthpiece for the instrument. It is debatable whether the mouthpiece with the instrument is the original. Paul recognized that the photos I had taken did not show a Grenser style denoting that it was not the original mouthpiece supplied with the instrument. Fortunately Paul had dimensions of a Grenser mouthpiece and was able to make one which we believe to be closer to the original than that currently provided with the instrument. Even the task of springing the instrument was not without problems. Finding the right type of brass to manufacture springs was also to prove time-consuming with a great deal of trial and effort. Traditionally brass springs are made by beating a strip of brass to harden the rather soft material. Again, the percentage of different metals will give different results to the finished alloy. After beating many grades of brass to harden them and testing the results, a grade was finally found that did not fracture, give up its hardness after a few depressions of the key or just not work. Finally, with the instrument together, the moment of truth. Although I am not much of a clarinet player, I have developed modern models that required tuning so I was aware of the task ahead. Given a couple of weeks with the instrument, and blowing at short intervals, I had managed to adjust my embouchure to make tuning the instrument possible. I had noticed in this period of adjustment that the tuning of the instrument was a little wayward, to say the least. I chose to ignore this minor detail to start with. Finding a reed to work with this style of mouthpiece was a major problem. All preconceived ideas of strength and cut went out of the window. Rather than finding a reed that enabled me to play the full compass of the instrument, I was looking for a reed that allowed me to actually play a couple of notes. As the weeks progressed this was not such a problem and I found from the box of rejected reeds that I could make many more of them work with a modest amount of scraping. Despite the general tuning of the instrument being 'all over the shop', it was quite apparent that at some stage in its life it had been retuned to A=435hz. Stefan required the instrument to play at A=430hz. I was aware of this retuning issue as I did note that the mouthpiece tenon and the socket in the barrel showed signs of work. It is also possible that if the threads were removed on the other joints that it may show signs of previous adjustment to body lengths and tenons. Initially tests had found the left hand joint to be roughly correct in its general compass. The right hand joint was very sharp, making the lower stock also sharp. A major amount of work to the right hand was required. Whilst making a copy of an instrument exactly to the letter was required, my brief from Stefan was for an instrument that could be used for performance. It was clear from playing the instrument that it would be virtually impossible to play this copy as it was. Whilst authenticity has been maintained with the look and feel of the instrument, I had to make it work. 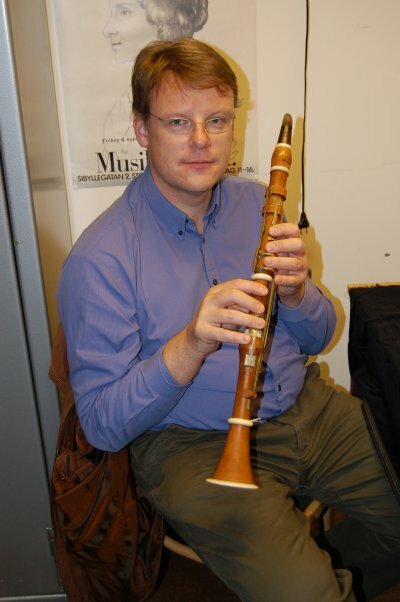 I am very fortunate to know Julian Wheeler, who is a period clarinet player. He was able to test the instrument for me as I was not aware of all the fingerings and techniques required to play early clarinets. His knowledge of these instruments was invaluable and I am indebted to him for passing this to me. After an hour or so of testing the retuned instrument, Julian gave it the thumbs up with just some minor tuning detail and spring tensions to attend to. I invited Stefan over to take delivery of his instrument. Stefan is now in the process of arranging concerts and lectures about Bernhard Crusell which he hopes will take place in 2010.